Rules are going to be broken – even in an airport. Thankfully, the TSA is there to catch those in the wrong (or sometimes just those who are forgetful) before passengers board planes. It isn't always guns that the TSA seizes either. Though in 2016, they did uncover a record 3,391 guns at airports. Throughout January, the TSA apprehended several different items in traveler’s carry-on bags. Let’s take a look at some of the craziest finds that they posted on their Instagram. This might just be the most intense item the TSA seized in January. A model rocket with the engines was uncovered in a checked bag in Greenville, North Carolina. No rocket engines are allowed in carry-on or checked bags. Drugs are of course a major issue that TSA faces daily. This traveler at LAX tried to hide his heroin in some festive wrapping paper, thinking that the TSA surely wouldn’t unwrap a present. Wrong. Now this is pretty spine-chilling. Found in Baltimore, the amazing TSA social media publisher naturally attempted to the ease the creepiness with the caption about this bone knife: “Make no bones about it, no knives are allowed to be packed in carry-on bags. I’d make a joke about it, but there’s nothing “humerus” about trying to take prohibited items on the plane." 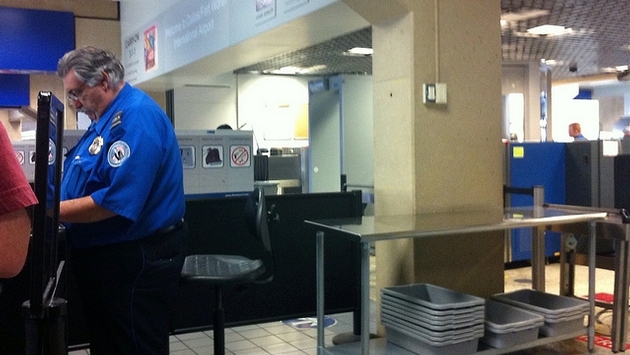 READ MORE Is Making TSA PreCheck Free to Frequent Fliers a Win-Win? Discovered in El Paso, Texas, this dashing cane is considered a concealed weapon, which can lead to fines and arrests. So even though you might need a cane for walking assistance, you better bring the wooden one to the airport and leave the sword at home. “An 80’s hair band called and they want their belt back,” reads the caption for this wild find. Why anyone would need this in their carry-on bag is beside me, but apparently, somebody in Richmond, Virginia did. I’m not sure what’s more disturbing here. The fact that someone in Newark, New Jersey tried to bring their garden hoe in a carry-on, or the fact that they attempted to bring a dirty garden hoe on a plane. We’re going to say that’s just dirt (and not blood) so we can sleep easier at night. Found in a bag at the airport in Seattle, Washington, one traveler was prepared for the unthinkable. Bears on a plane? Sounds like a good sequel to “Snakes on a Plane,” so somebody call Samuel L. Jackson and get that rolling. He’d have to save the day, because bear repellent isn’t allowed in a carry-on bag.